Francis D’Amico, owner of D’Amico Foods and coffee roasters on Court Street, says he’ll be shelling out $30,000 to install an “after burner” to filter out the smell of roasted coffee from his coffee roasting operation — a smell that has defined the block of Court between Sackett and Degraw for decades — after a city inspector visited a second time, and said that such a machine was needed. Back in February, an anonymous neighbor of D’Amico’s complained to the city about the strong smell of roasted coffee, prompting the inspector to visit, and setting off a media firestorm in defense of the old-time Italian Court Street staple. For a moment, after all the protest, and defense of D’Amico’s, it seemed the issue would just go away. But apparently, following an additional complaint, the inspector returned, and the coffee shop will now install the machine. “We were going to do it anyway, but it’s the timing,” that’s a problem, Francis said. A month or so ago, Joanny D’Amico, Francis’ wife, said if the city fines the coffee shop and requires the machine, it could shut down the roasting operation on Court. But it seems the family-run operation has found a way to maintain the roasting on Court in addition to the Italian deli and coffee/tea supply store. In case you’ve been on vacation or working too hard to notice, there’s been a mad hullaballoo in Brooklyn of late surrounding D’Amico’s and their famous, daily coffee roasting that fills Court Street with the smell of rich roasted coffee beans. Seems someone complained about the smell to the city through 3-1-1, the city sent an inspector, and the inspector said the coffee shop would have to install an after-burner, something now required by the city. However, the inspector has not returned, and told Joanny when he visited that he wasn’t sure if older businesses were “grandfathered” in. 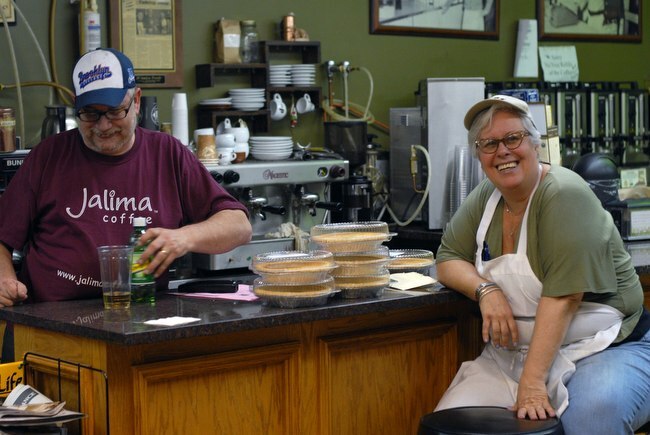 (Read our July feature story on the history of D’Amico coffee on Court between Sackett and Degraw, which opened in 1948.) Zagat’s rated D’Amico coffee the best in the city in 2006. “The gentlemen left and never came back,” Joanny said. In the meantime, several media outlets picked up the story. It all started when the local blogger Katia Kelly posted something on the affair, including a photo of a note on the door of D’Amico posted by Joanny. The sign urged folks to come in and talk to the shop if they have a problem. “We’re pretty flexible and accommodating,” Joanny said. “We try to work with the neighborhood,” Joanny said. Gothamist, the New York Observer, CBS New York and others picked up the story. Underlying the press accounts is a palpable anger pointed at whichever newcomer it was (or so that’s the going belief) whom complained to the city about the smell. Meanwhile, the flustering has been good for business. So while all the venom about new yuppies in Carroll Gardens has been unleashed in the coffee melee like a cage of rabid vipers dying to get let loose (see this quote from a New York Observer article: “But as we’ve spent a lot more time over in Carroll Gardens recently, we’ve noticed that this issue is the symptom of an epidemic: people who move to Carroll Gardens are terrible,” in a story titled: Carroll Gardens: The Most Entitled Area of Brooklyn) ), the community has actually been pretty embracing to D’Amico’s in light of the kerfluffle, Joanny says. “The community is backing us,” Joanny said. Reading this makes me sick. The person who is calling is spineless. I mean honestly how much of a tool are you to be calling a place out that has been around for generations because of a coffee smell. I am somewhat new to Carroll Gardens especially compared to the D’Amico’s and would just like to say not all new residents are selfish assholes. Just wanted to let you know that another complaint has been made against D’Amicos roasting, so it looks like the problem is not going away as easily as we thought. Unfortunately, the person making the calls has not come forward, as we would like. We are not sure what will happen next but I will keep you posted. Thanks for all the support.